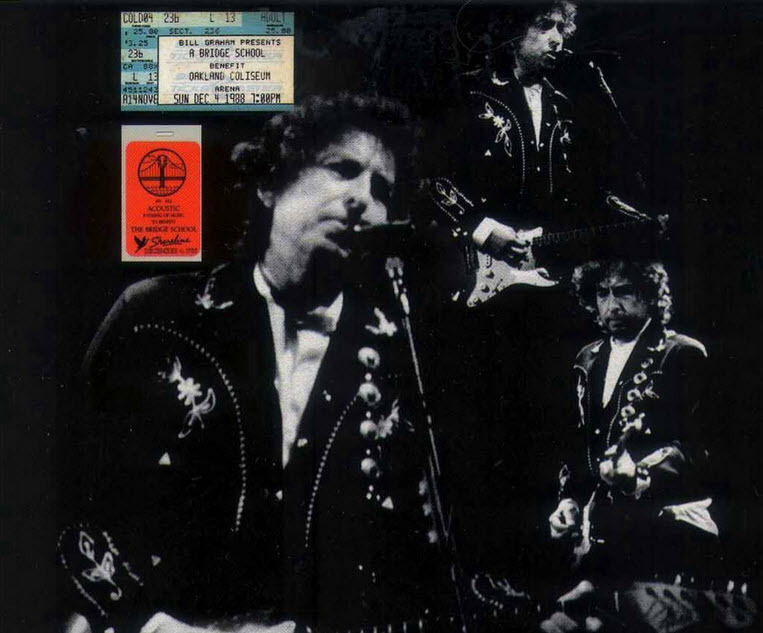 The tape of the benefit performance shows that Dylan’s voice had recovered significantly during his six weeks off; unfortunately, it also suggests again that the two-guitar acoustic set format was not very stimulating for Dylan as a performer in 1988. These are again lackluster, uninspired performances, interesting solely because this was only the third time in his career that Dylan is known to have performed “Pretty Boy Floyd” on stage and because, as he had at the October shows, Dylan added Lo “With God on Our Side” a verse about the Vietnam War that he didn’t write – the Neville Brothers had added it when they recorded the song on an album produced by Daniel Lanois earlier that autumn. An all acoustic evening of music to benefit The Bridge School. In the nineteen-sixties,came the Vietnam war. Can someone tell me, what we were fighting for? So many young men died, so many mothers cried. No I ask the question, was God on our side? It’s just such wonderful music! Thank you for bringing it to us. I was at this one. A great night…believe it or not, Billy Idol was a stand-out! Is this available officially? It’s really good.